Established in 2004, Lion’s Rest is situated in a quiet up-market residential area in Mafikeng. 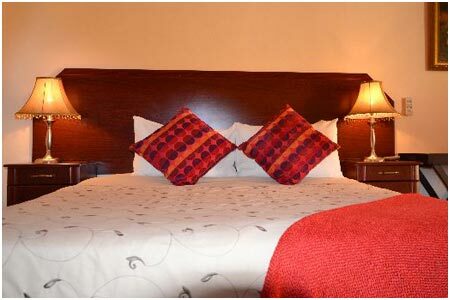 Lion’s Rest is ideally situated for a stopover for the business traveler and relaxing for a weekend break- away. Owner- managed, Lion’s Rest Guest House is considered to be one of the best guest houses in town. We have been graded as a 4 star establishment by the TGCSA, and also as Superior by the AA Travel. 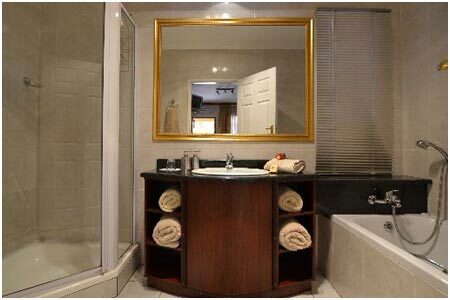 We have 8 purpose designed rooms, all with private en-suite bathrooms, including both a bath and a separate walk – in shower. Our rooms have been designed for the comfort and convenience of the business traveler, with a well lit work surface and conveniently placed power points. All of our rooms have private entrances and independently controlled air-conditioning, TV with Dstv, bar fridge, tea/coffee facilities. All the rooms have been fitted with a digital safe. In the event of a power failure we also have a back – up generator with sufficient capacity for the entire guest house, to ensure that our guests are not inconvenienced. Our rooms have either a queen size bed, or two single beds. Our linen is of outstanding quality and we only use 100% cotton Percale sheets. Our rooms have been tastefully decorated, with soft furnishings carefully selected to compliment the original oil painting in every room. It creates a tranquil atmosphere for the guests to relax. For the safety of our guests and their vehicles, access to the premises is via an electronic gate. The property is surrounded by a 2.5m high security wall, and this secure parking at Lion’s Rest makes your stay in Mafikeng trouble free. Only registered guests are allowed on the premises, as all additional visitors are required to register at Reception. Our breakfasts are presented in a buffet- style and enjoyed in the Sunroom. It includes a cold breakfast of cereal and yoghurt as well as a full hot English breakfast. Dinner is available on request and must be booked 12 hours in advance. The Sunroom is furnished in a traditional style, with solid kiaat wood furniture and antique cabinets. Our Sunroom as well as the Lapa can be used for small conferences. We can accommodate up to 30 persons in the Lapa. The Lapa is situated next to the swimming pool and is a popular training venue, especially in the hot summer months. It is equipped with a white screen, flip chart,white board,TV and DVD player. Please contact us with your requirements.